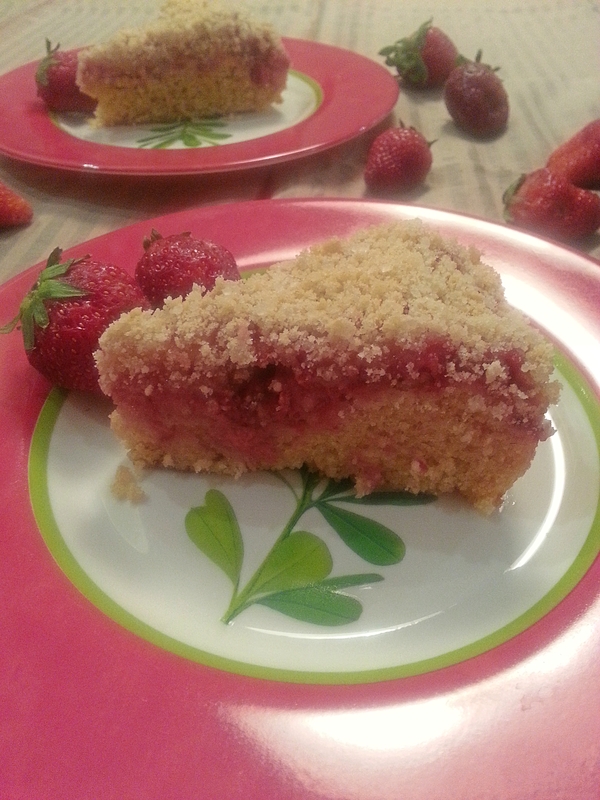 I went to the fruit market today and picked up some fresh strawberry i was really excited to make this lovely strawberry coffee cake, I had it a few days back at a friends place and absolutely fell in love with it i have been craving for it ever since. The cake is irresistibly delicious it is so soft and buttery it just melts in your mouth. 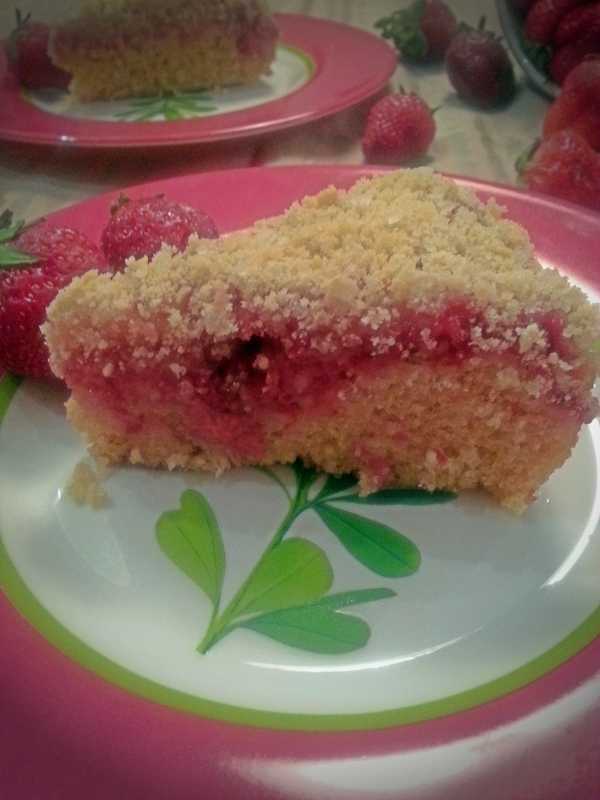 Fresh juicy strawberries make it so flavourful and crowned with an incredible crumb topping the cake is a hit. I left it on the kitchen counter for my resident food critics to give their verdict (not sweet enough, too rich……you get the gist) instead i came down to find nothing but an empty cake stand and a trail of crumbs. Preheat the oven to a 180 degree centigrade. In a bowl add the flour, sugar, baking powder and salt mix well. Set aside. In another bowl, add the eggs, milk and butter stir to mix. Add the dry ingredients to the wet mixture and mix thoroughly. Pour the mixture into a greased 8-inch round baking dish place the sliced strawberries evenly over the top of the batter. To make the crumb topping combine the flour and sugar in a bowl add the butter and with your fingers mix until it resembles coarse crumbs. 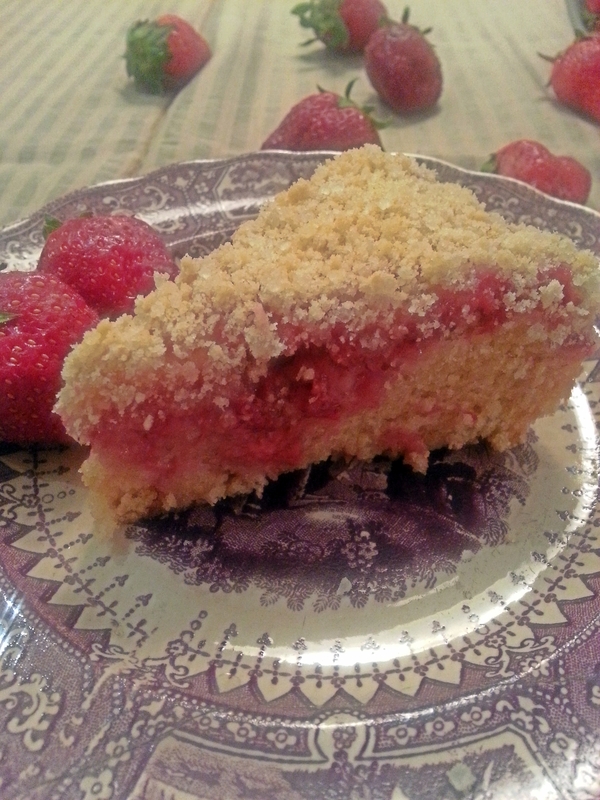 Sprinkle the crumb evenly over the strawberries and bake until a tooth pick inserted in the centre comes out clean around 30-35 minutes. Thanks. It did turn out very well it was my first time that I had tried this cake and yes I wasn’t disappointed.